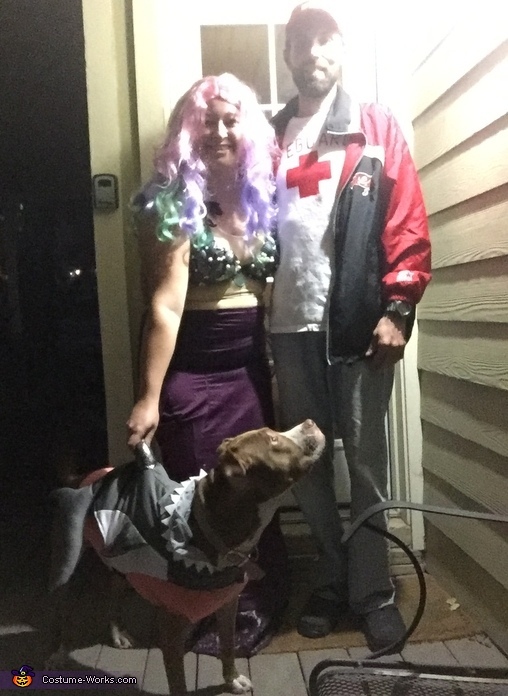 I bought the shark costume for my dog at the store. From there we decided to do a family theme. My boyfriend is the lifeguard. Red hat from the dollar store has white medical tape in the shape of a cross. Then I took one of his white tees and used a red sharpie to draw the Red Cross and Lifeguard. Since we were in cold weather he decided to wear his jeans instead of the lifeguard shorts. Can’t blame him! Thankfully he did wear the red jacket. I decided to be a mermaid. Took an old bra and wrapped it in the dress material. Bought shells from the dollar store and painted them and added glitter. Glued them and pearls to the bra. Found a beige cami at Walmart for $2 to wear under the bra. The wig I bought at Fry’s Food store a couple years ago. The mermaid tail is a modified prom dress. I cut off the girdle from the top portion of the dress. Then used the no sew iron on tape to shape the bottom of the tail. Used the lace from the girdle and added it to the bottom of the tail. Added my accessories of a sand pail and neon glow stick in the shape of a triton.